Search for best rates and see reviews! The Aston Mahana at Kaanapali Beach Maui is NOT your average 3.5 star place. 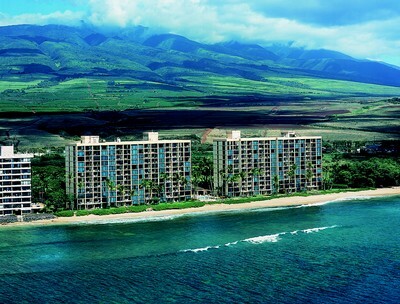 Every single one of their beautiful condo rentals in Maui is oceanfront! Nope... not just oceanview, but spectacularly located right in front of the ocean! And, if the breathtaking views of the Pacific aren't enough, they also throw in drop dead gorgeous views of the islands Molokai and Lanai! 540 avg. sq.ft. 938 avg. sq.ft. 938 avg. sq.ft. 1418 avg. sq.ft. Lastly, if you love to snorkel as much as I do, you'll be thrilled to know that not only is there a coral reef located right off shore, but snorkeling hot spot Black Rock is only minutes away! 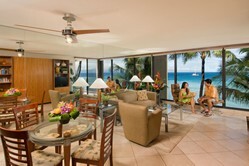 If you stay here, you'll have signing privileges at the nearby Aston Kaanapali Shores Beach Club Restaurant. The Beach Club Restaurant serves up casual Pacific Rim and American cuisine 7 days a week for breakfast, lunch, dinner and cocktails. Of course, you'll also have that fully equipped kitchen in your suite if you want to prepare your own meals! For one of my favourite places to search for rates click here or use the search box on the left. Mahalo to Aston Hotels for providing the pictures used in this article! Read more about Kaanapali, Maui: Where to stay, things to do and more!